David is employed by BAE Systems, and is responsible for all the engineering work being carried out on the QE Class programme. Previously, he was design manager for HMS Ocean, Albion and Bulwark, and was chief engineer on the Type 45 Destroyer programme. The next few weeks are going to be busy for the Aircraft Carrier Alliance (ACA) with some very significant events in the build of the nation’s flagship, Queen Elizabeth. This will result in the most significant visible signs to date of the progress that has been made in the three years since the start of the Manufacturing Phase Contract for the two aircraft carriers. On the last day of July Lower Block 03 (LB03), comprising the six-deck centre section of the aircraft carrier up to the hangar deck, was loaded onto the semi-submersible barge on which was used to transport the block from the BAE Systems shipyard at Govan on the Clyde to the build dock at Rosyth on the Forth. The transporters used for the load out of LB03 from the build hall onto the barge will then be utilised to move a significant portion of Lower Block 04 (LB04) into position in the build hall at Govan for combination with the rest of LB04. 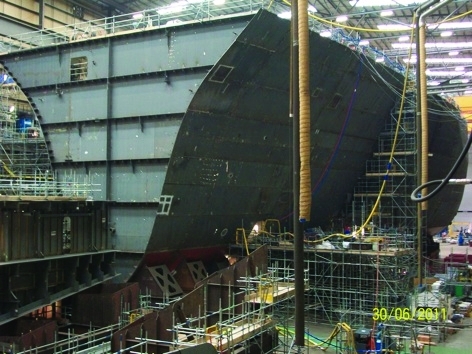 In parallel, the units comprising Centre Block 03 (CB03), the top four decks up to flight-deck level, that have been built at A&P Tyne’s facility at Hebburn will be shipped from the Tyne up to Rosyth in units weighing up to 800 tonnes, and at the end of September the lifting of these units into position on top of LB03 will be the first job completed by the ACA’s Goliath Crane at the build yard. All these activities will be happening on exactly the dates that were set at the commencement of the Manufacturing Phase just over three years ago, a terrific achievement for the ACA, its Alliance Partners and the huge number of suppliers and sub-contractors to the ACA. LB03, weighing in at over 7,500 tonnes, is comparable in terms of weight to a significant ship, and at the point of transportation, has achieved a high level of completion. It is painted and insulated internally, with thousands of metres of pipe, electrical cable and vent trunking installed. The Auxiliary Machinery Space is fully fitted out, the magazine spaces are fitted with magazine doors and hatches, lift trunks and the rail system for the Highly Mechanised Weapon Handling System and many of the cabins in the accommodation spaces are installed into position. Movement of the huge structure from the build hall across the concrete apron area and then across the quay wall onto the transportation barge was achieved over a three day period using a system of very powerful transportation trailers. Load out onto the semi-submersible barge was via the quay specifically built for the operation at Govan and was be accomplished over the duration of one tide. Ballasting of the barge with sea water will be carefully managed to ensure that the deck of the barge remains level with the quay wall during the load out operation, taking account of the weight of the block and the state of the tide. The barge was the moored at Govan for about a fortnight while the sea fastenings attaching the load to the barge were completed prior to its sea journey from Govan up round the north of Scotland down to Rosyth. In support of the ACA’s partner charity, the Royal Navy and Royal Marines Charity, which supports former and current personnel, including those currently serving their country, Royal Navy and Royal Marines veterans and the families of those who have been lost in action, a team of cyclists from the ACA departed from Govan at the same time as LB03 for a gruelling 500 mile cycle ride around Scotland including climbing Glencoe and the Great Glen in an attempt to “Beat the Block” to Rosyth. For anyone wishing to sponsor the team and support this massively worthwhile charity please visit the website http://uk.virginmoneygiving.com/beattheblock. Having mobilised the transportation trailers for the load out of LB03, the same trailers will then be used to move parts of LB04 into position ready for combination into a single block. LB04 is the largest single block of the aircraft carrier comprising most of the aft end of the ship including the main machinery spaces and propulsion motor spaces. The main diesel generators and propulsion motors are already installed onto their seats in LB04 and shipping of the high voltage switchboards has commenced. 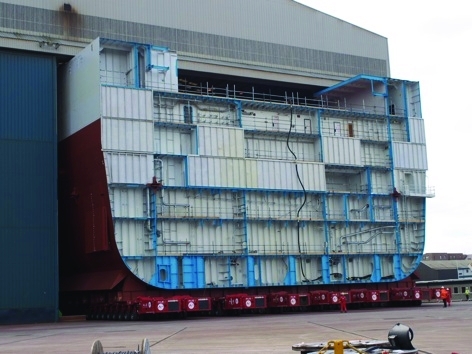 Next November, on completion of LB04, its load out and transportation to Rosyth will follow a similar process to that currently taking place for LB03. CB03 makes up the sides and deckhead of the hangar and the spaces on two deck above the hangar, culminating in the flight deck. Although it has been built in units that are capable of being lifted by the Goliath Crane, it has nevertheless achieved a high degree of completion with much of the painting, insulation, pipe, cable and vent being installed. 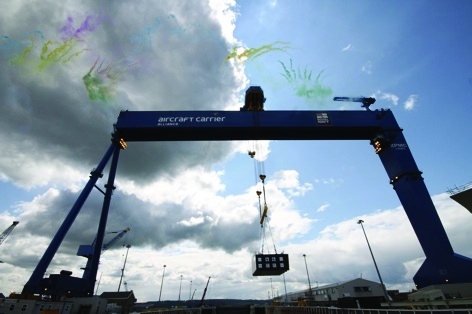 Commissioning of the Goliath Crane at Rosyth by the crane manufacturer ZPMC is progressing well and it has already lifted many proof weights. To mark the successful installation of the crane a ceremony was held on the 29th June. This was a great day with a pipe band, speeches and a firework display from the crane structure followed by a reception at Edinburgh Castle and marked a very significant event in the project. A simulator has been set up at Babcock’s facility in Rosyth so that driving the crane in a variety of environmental conditions can be simulated and is being used to train the crane drivers. Having had a go at the simulator myself I have been told to stick to the engineering and let someone else do the crane driving! To round up progress on the aircraft carriers around the country; at Portsmouth all the rings of LB02 have now been combined and fitting out is progressing well leading towards transportation to Rosyth next year. 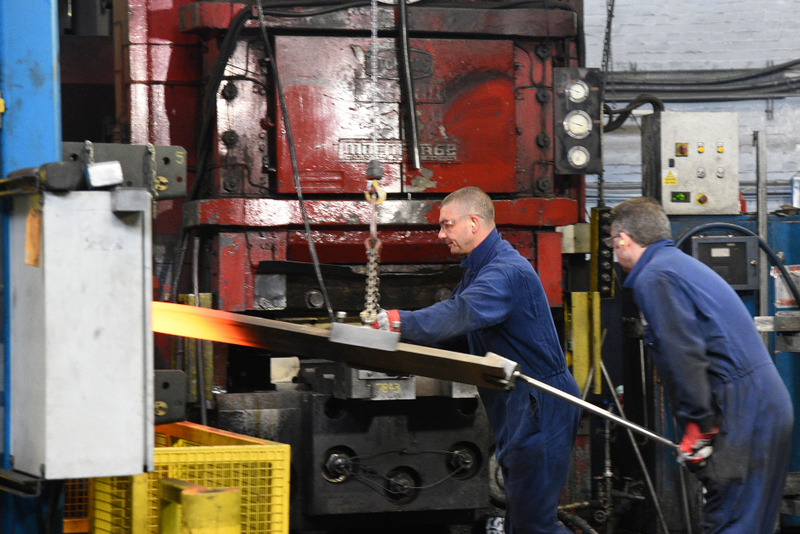 The rudder horns are just about to be installed into LB05 and first steel has been cut for the construction of the forward island. At Frimley, Factory Acceptance Tests are being carried out on the Combat Management System and the Integrated Network Environment software. 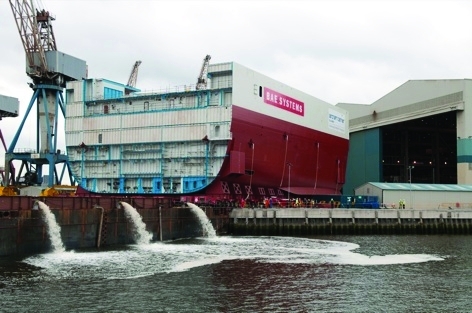 The final Design Intent Review for Queen Elizabeth on sponson 12 has been completed at Rosyth and steel work has commenced at Govan for the construction of LB03 of HMS Prince of Wales. With work also progressing with the design of catapults, arrestor wires and other aspects of the conversion to CV aircraft at Bristol, this is proving to be a very interesting time to be working within the ACA in delivering the nation’s flagships. A feature on the departure of LB03 from Govan will be on The Engineer website next week.